Equatorial dial 5 ft high, 6 ft. wide and 4 ft. deep. 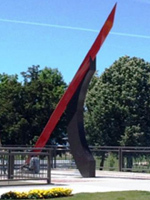 The dial was designed by Pete Swanstrom, built and donated by JST Custom Fabrication Inc. of Boise. The gnomon is of unusual design with a central pivoting elliptical plate and analemmatic cut out. The analemma is marked with 365 individual date marks. Shadow falls on equatorial ring with hours marked from 7am to 7pm and inscribed with lines for every minute (spaced 1/7 inch apart). 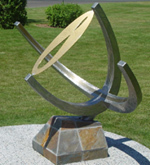 Indicates time to less than 15 seconds, making it among the most accurate sundials in the world. Indicates true time to the minute, date to the day, and adjusts for Daylight saving time. The Latin inscription should read "Tempus Captum" rather than "Tempus Captus". This is NOT a sundial! So far, I have been unable to contact the sculptor to get any additional information.